Last night we returned to our mission to empty the freezer. This mission had been going so well, as it often does, until I foolishly bought and prepared an immense amount of food to add back to our limited freezer space. My goal for this week is to work once again at emptying our freezer so I can once again fill it with food we do not need. 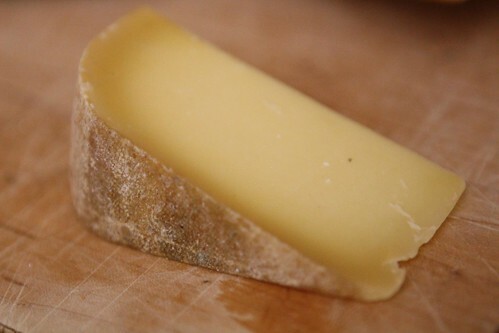 But first I started out with this Pleasant Ridge Reserve Uplands Cheese. It's made with raw, grass fed cow's milk and it was pretty tasty, though a tad expensive. And, get this: it's made in Wisconsin of all places! Who knew they made cheese in an obscure state such as Wisconsin? I mean, it didn't even achieve statehood until 1985! 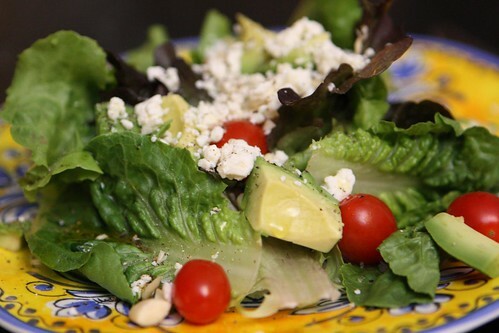 To start off I made a salad with heirloom lettuce, grape tomatoes, feta cheese, blanched almonds, avocado, olive oil, salt, and pepper. I was wondering when I'd get a chance to use up that lettuce that was handed down to me from my great great grandmother. I was able to clean out the freezer nicely with this pasta dish. I boiled two lobster tails, then removed them from the water and cooked some leftover dried linguine in the same water. This actually imparted a very nice lobster flavor to the dish, even better than I'd expected. In a pan I cooked some crushed garlic and shallot in butter and olive oil. To that I added some of the chopped up leftover pink peppercorn crusted pork tenderloin. 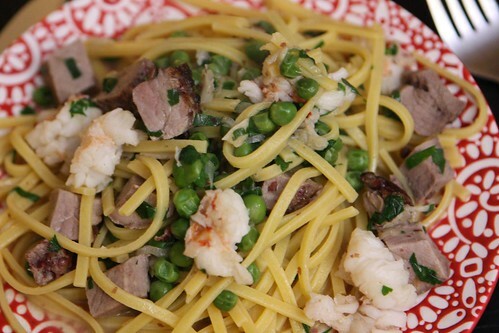 Then I added some frozen peas and the chopped lobster tail before adding the cooked linguine along with some of the pasta water and salt. Before serving I tossed in some chopped parsley and green onion. 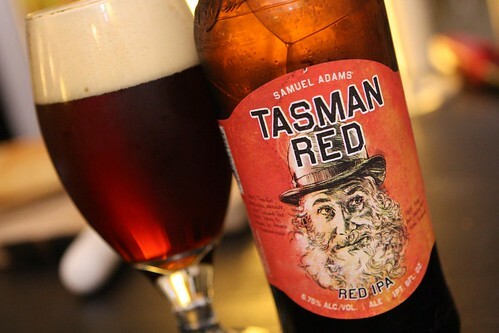 To accompany this seafood dish I had this Tasman Red Red IPA from Samuel Adams. I'd received a recommendation on it and picked it up a while ago. At $4.99 it was an amazing deal and a very nicely made beer. I'm not a huge Sam Adams fan but this beer was a real winner. It had a nice molasses maltiness in conjunction with the hoppy character you'd expect from an IPA. Plus it had an insane looking (presumably Tasmanian) man on the label, perhaps to honor the Tasmanian hops used in its brewing. This beer is the first in Samuel Adams's "Small Batch Series" and if it's any indication of what direction they are headed with this series then I look forward to picking up some more from this line. At $4.99 a bottle it seems like I can't afford not to try more of this series. However, what is the cost of Jen's anger when my beer collection continues to swell? My guess is: high.